Nature Coast Termite&Pest Control, Inc.
Providing Termite and Pest control service’s for Pasco, Pinellas & Hillsborough counties at affordable prices ... Business or Residential. Just ask us for your free inspection report. Order yours here online today! Insect treatment for your home, office or commercial property. 5 & 10 year treatments for Subterranean Termites. Call us for the "Bee Guy" to remove those pests. We can rid your lawn of ants including fire ants. 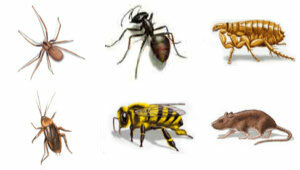 We can eliminate these creatures and more from your property.